If you have had eye cancer diagnosed you are probably wondering what happens next. Your doctor will assess the type of cancer, how advanced it is and its exact location and will discuss with you the various options available explaining how the different methods works and what their effects are likely to be. This information combined with your personal details such as past medical history, age, general health and how you feel about your proposed treatment plan, will also help determine which course of treatment is best for you as an individual. It is advised however that you make sure your care is being planned by a specialist in the field of eye cancers as it really is a specialised area and is actually quite rare compared to other forms of cancer. For very small or benign tumours you may need no treatment at all and may simply have to attend regular check-ups to ensure the tumour is not growing or changing in any way. Of the other treatment options, you may need just one type or a combination of the methods in order to achieve the most hopeful and advantageous result in the long term. One possible option is to have surgery on the eye. This does depend on the nature of the tumour, its location and how much it is already affecting the eye. In the worst cases where sight is already severely affected the best option may be to remove the eye itself in the hope that this procedure will remove all of the cancer meaning its chance of affecting the rest of the body is very small.It may also be possible to remove just the tumour itself (and a little surrounding tissue in case there are any cancerous cells around it). This however is more likely if the tumour is quite small and very contained. Laser therapy works as the cancer cells are very sensitive to the intensely hot beams emitted by the laser. This beam can be focused on the actual tumour and aims to destroy and reduce the tumour. It is likely that you will need a few appointments in order to destroy the whole tumour and because of this, laser therapy is usually only used on small tumours that are very contained. The procedure can be carried out under local anaesthetic but not all areas have easy access to the equipment needed so you may have to travel to find an establishment that offers this service. 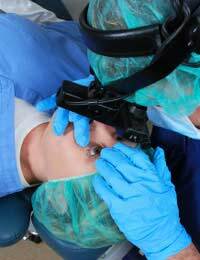 Treating eye cancers with chemotherapy involves giving the patient highly powerful cytotoxic drugs which aim to kill cells. These drugs are very strong and can have some negative side-effects as they can target other cells in the body too.Chemotherapy is not a good option for all types of eye tumour and your doctor will be able to explain which type you have and how it can be treated in the best way. Radiotherapy works by exposing the cancer cells to very highly powered rays. It works well for smaller tumours but is not often used for larger tumours as it can destroy the sight so surgery works just as well with fewer side-effects. The radiotherapy may be given to several doses and depending on the nature of the tumour, can also be used on the surrounding tissues and even the brain and spinal region if it is thought there may be cancer in these areas too. Eye cancer can be very destructive and needs treatment most of the time. Many people will benefit from receiving a combination of the available treatments and your specialist will be able to explain how these work and what sort of effect they might have on you. Eye Melanoma: What is It?